Elizabeth Ludwig brings readers to 1890's America where Irish immigrant, Cara Hamilton, is alone in America and searching for the only bit of hope life has left her. 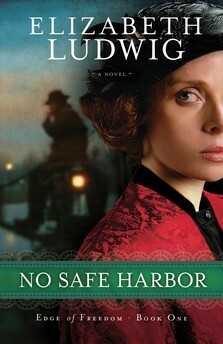 No Safe Harbor is a historical fiction romance full of suspense, secrets, and mystery. Ludwig's excellent writing brings reality to this fictional tale. Cara's vulnerability when arriving alone in an unfamiliar country reaches out and grabs your heartstrings. When Rourke rolls around lending a helpful hand it seems like fate, until his intentions become known as less than generous. Switching between perspectives of the main players of this novel is a great way to keep readers engaged in the turn of events. While we may know what's going on, true intentions are still hidden until Ludwig is ready to reveal all. The suspense is light but saturated throughout the whole novel. Tension radiates from Cara as she tries to keep her secrets close to her heart while searching for her brother. Her searching gives her insight into the political unrest of Ireland that found its way to America. I liked that the story didn't just focus on the budding romance between Cara and Rourke, or the dislike that radiated from one of Cara's housemates. The historical fiction aspect is very prominent in the plot and helps you feel as though you've been transported back in time over a hundred years. No Safe Harbor is just the beginning of the Edge of Freedom series and it's extremely exciting to see how Ludwig will continue the plot!